I use these frames constantly to sell my artwork. They are hardwood (not easy to find these days). The black in particular hold up well to traveling (I do art festivals) and small nicks can easily be repaired. The size is a nice medium size, does not overwhelm smaller artwork (16x20, 18x24). This is a beautiful frame. The quality is exceptional and the workmanship was excellent. I will use your services again without hesitation. Little nervous at first to order without seeing a fit, but the certification fits not the frame perfect. I chatted with a rep and she told me what I needed to know to make the purchase. Sent this to a client and was disappointed to learn that the hanging hardware was installed upside down. Not what I expected for the total price of frame, mat, print and shipping. It now has become a poor reflection on my work and the vendor I chose. Hi Arnold. Thank you for your review. We have passed your feedback along to our team so that we can ensure that this is not an issue. We understand that you have other framing options and appreciate that you chose us to serve you. We hope to gain another opportunity in the future. If there is anything more we can do for you, please let us know. Our customer care team is available Monday-Friday 8am-7pm eastern time and can be reached at 1-800-332-8884. Thank you again! I love the frame and the workmanship is excellent. Maybe, as you can see from the photo, I should have selected non-glare. At the time, I was worried it would subdue the colors of the artwork. The only reason this isn't 5 stars is that the frame costs more than the art did! 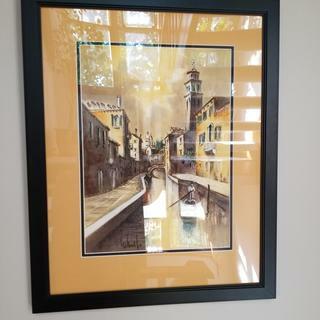 The simple frame showcases the complex artwork instead of detracting like the current frame that is being replaced. An excellent frame for art work. Best used with creative matting. Very unusual size that can't be found in stores. I purchased a similar frame years ago, with a mahogany finish (AR7), and I love it. The low profile adds a subtle air of elegance to the framed work without being overbearing. I prefer this particular frame style in situations where I want to use a wood frame instead of metal. For WWII photograph, sophisticated and masculine. A larger frame width and mat at 3.5 inches can make a big difference in setting off a larger watercolor. The white mat isolates the painting colors against a neutral white and makes them brighter. Previous experience with this frame. I have purchased this frame in different colors multiple times. Consistent quality, compatible with many of the images I frame. Purchased this frame before. High quality, affordable. Highlights the photographs very well. does glass come with it or just the frame? BEST ANSWER: It depends on the option you choose in section 3. You can choose to purchase just the frame or the frame and specific type of glass. Hello ~ This frame came with a double mat and the acrylic sheet (instead of glass) that I ordered. The frame and mat and acrylic were PERFECT!!!!!! The packing of the items was done with such care, it was tremendous. One other thing I really liked with Picture Frame compared to another popular frame company, is the way Picture Frame covers their acrylic sheets. The covering is labeled and is easy to remove...not so with the other company. If you order just the frame, the mat and acrylic sheet will not be included in your order. The Picture Frame website 'walks' you through all the steps, so you get EXACTLY what you want. No. You can buy acrylic glazing separately through the website or buy glass locally. I usually buy glass from a local framing shop. I ordered just the frame. You can add on an acrylic front. No option for glass. Hello - I don’t want a glass or acrylic cover, but interested in the foam core back. Is it possible to just get that? If not, do you think it would be possible to fit a thin layer of cork behind the art (very thin paper) and the backing / frame? This is being used for a push pin map and need something for the pins to stick into. Thank you for your inquiry. If you call our friendly framing experts at 1-800-332-8884 they would be more than happy to place an order for you that includes the frame and backing only. Specialty orders like this have to be done over the phone. We are looking forward to hearing from you soon. HELLO!!! 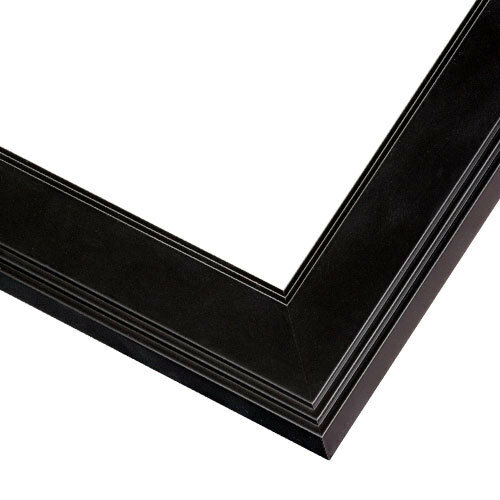 This frame should work for the purpose you want.... You might ask the experts at Picture Frames to be safe!!!!! I LOVE PICTURE FRAMES!!!!!!!!!!!!!!! THEY ARE THE BEST!!!!!!!!!!! You might have to order it that way by phone, if the online method won't let you order backing but no glass. If not, Walmart sells foam core. For AR2 Black Frame - what is the dimension of the rabbet in the other direction? On the diagram I see that it is 1/2" deep but how much of the rabbet will cover the edge of my artwork? Need this to order the right size. Thank you! BEST ANSWER: It sounds like you are talking about what we refer to as the lip of the frame, typically it is 1/4" that would extend over your art to hold it in the frame. We recommend ordering by the size of your art work, the back opening of the frame will be cut to the size you specify. 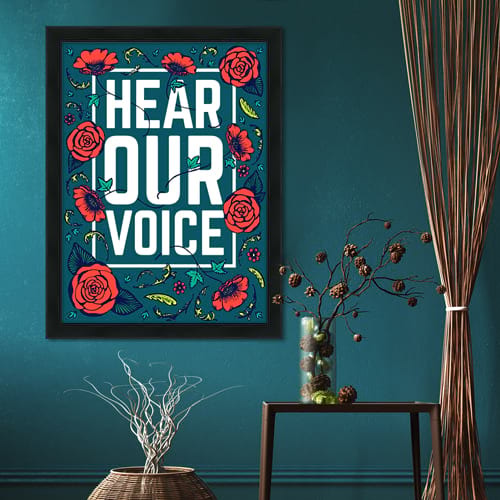 If you are trying to have extra space around your art you may want to discuss specialty options with our Customer Care Team at 1-800-332-8884. 1/4 inch will cover the edge of the artwork. Is there a wire and hanger included? BEST ANSWER: Hello. Yes indeed! We include the hardware and hanging wire with the frames. Happy Framing!